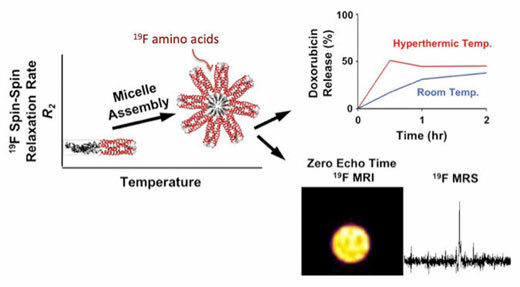 (Nanowerk News) A team of researchers from New York University has engineered nanoscale protein micelles capable of both delivering chemotherapeutic drugs and of being tracked by magnetic resonance imaging (MRI). Her research paper, "Protein Engineered Nanoscale Micelles for Dynamic Magnetic Resonance and Therapeutic Drug Delivery," was published in the American Chemical Society journal ACS Nano ("Protein-Engineered Nanoscale Micelles for Dynamic 19F Magnetic Resonance and Therapeutic Drug Delivery"). It was co-authored by Radiology Associate Professor Youssef Wadhghiri at the Center for Advanced Imaging Innovation and Research and the Center for Biomedical Imaging, both at the NYU School of Medicine; Lindsay Hill, a student working with both professors; Priya Katyal, a postdoctoral researcher in Montclare's lab; Minh Hoang and Zakia Youss, both researchers working with Wadhghiri; Joseph Frezzo, Cynthia Xu, and Xuan Xie, all former students of Montclare; and Erika Delgado-Fukushima, an undergraduate student in her lab. As a solution, Montclare and her co-authors present the biosynthesis of a protein block copolymer containing amino acid building blocks with (19F, termed "fluorinated thermoresponsive assembled protein" (F-TRAP), which assembles into a nanoscale micelle with noteworthy imaging properties along with the ability to encapsulate and release small therapeutic molecules.